Happy, happy New Year! I hope your holidays were full of fun and celebration. After a long and crummy sickness, I’m ready to get back into the swing of things. To kick things off, I got my hands in some dough. I’m not one for declaring New Year resolutions, but I would like to make more doughs, so maybe I resolve that 2019 will be a year of dough. I tried out a focaccia recipe that is so, so delicious. I knew I needed to share it with you! Samin Nosrat’s Netflix series Salt, Fat, Acid, Heat was one of the best shows I watched last year. It looked at the four elements of cooking–salt, fat, acid & heat–through the lens of four different cultures. I’ve tried several of the recipes from this series & they all shine (these soy-braised short ribs from the episode on salt are definitely worth a little effort!). 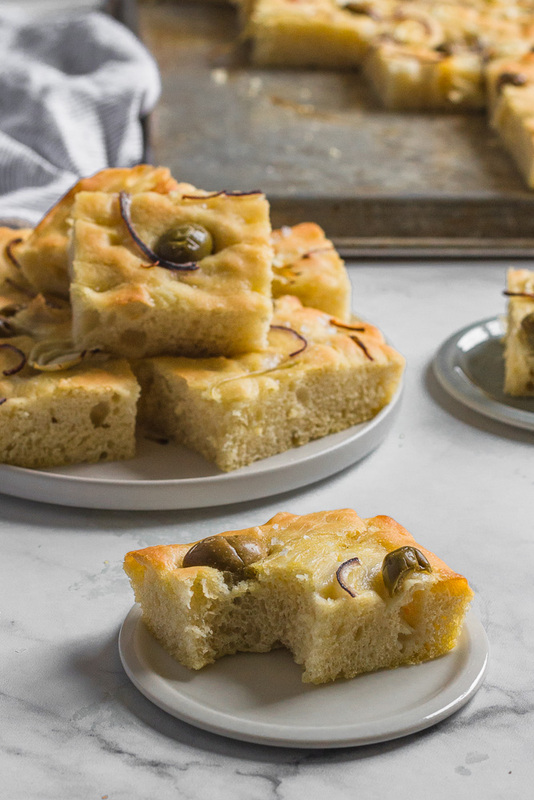 This Ligurian Focaccia recipe comes from her amazing episode on fat. This focaccia bread is a dream. There are golden, crispy edges with a pillowy interior that has plenty of chew. It’s perfectly savoury and salty. Don’t skimp on the olive oil quality. The better the oil, the better the focaccia. The recipe stems from an episode on fat remember! You’ll be rewarded. If you do use a really good olive oil, the flavor is amazing. I couldn’t leave well enough alone and added some green olives, red onion and thinly sliced fennel to the top of the bread while it baked. I don’t regret it. The dough for this focaccia is super simple to make. It requires no kneading and a little patience. It’s an easy weekend baking project you won’t regret. You simply stir the dough together in a big bowl, let it hang out over night, stretch it out into a rimmed baking sheet and then give it two short proofs. Seriously simple dough. 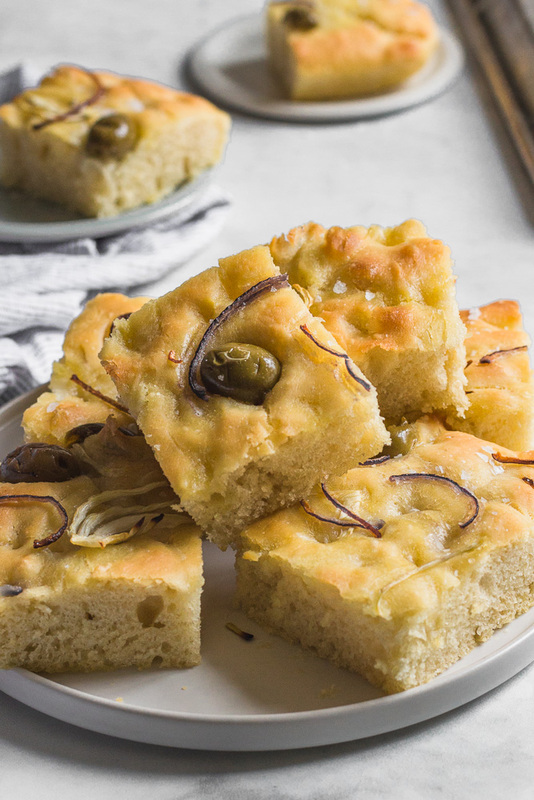 This recipe makes a hearty portion of focaccia. Since an entire sheet pan of focaccia was a bit much, even for a bread enthusiast like me, I cut the focaccia into serving size pieces and stashed it in the freezer. And what a win that was! It freezes beautifully. If you wrap the leftover cooled bread tightly in plastic wrap and stash it in an airtight container or bag, you can focaccia whenever the mood strikes. Just wrap the bread in foil & reheat it in a 325 degree oven until warmed through, then unwrap the bread so that the edges crisp back up a little. This bread has claimed its place as my go-to focaccia recipe. If chewy, golden, crispy, pillowy bread is your thing, you should definitely give it a go. It’s easy, delicious, & full of flavor. Here’s to a year of more dough that’s as perfect as this focaccia! 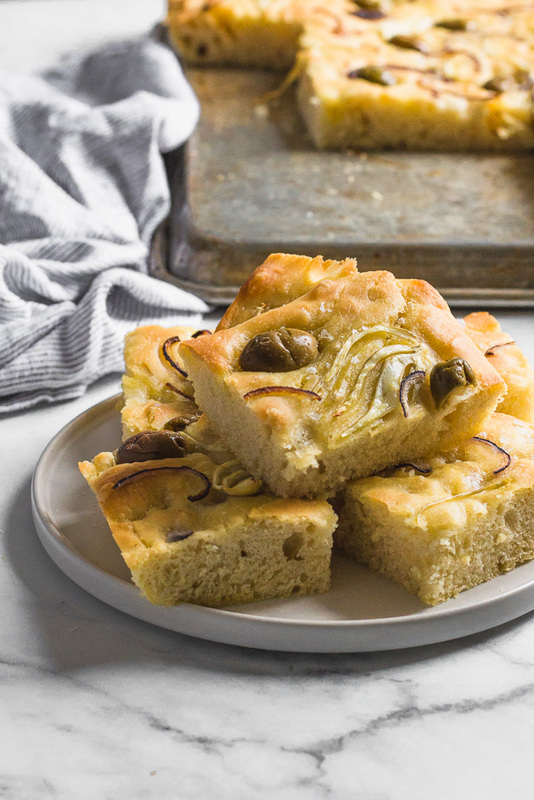 This Ligurian Focaccia is golden and crisp on the outside & fluffy and chewy on the inside. Each bite is full of fruity & peppery olive oil and crunchy salt. 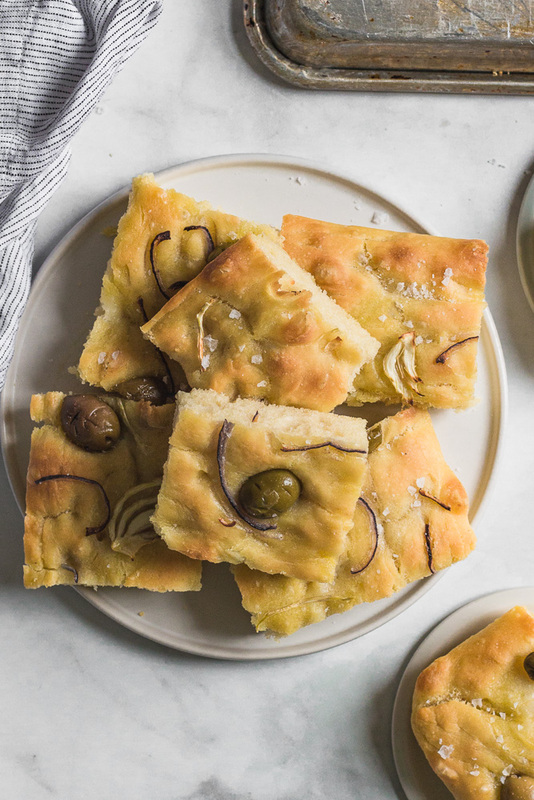 Use the best extra-virgin olive oil you can and this will be the most delicious focaccia you've every had! In a medium mixing bowl, stir together water, yeast, and honey until everything is dissolved. In a large mixing bowl, whisk flour and 2 tablespoons kosher salt together. Add the yeast mixture and olive oil to the flour. Stir with a rubber spatula until just incorporated. Scrape the sides of the bowl clean and cover with plastic wrap. Leave the mixture out at room temperature to ferment for 12 to 14 hours. It should be at least doubled in size. When the dough is ready, spread 2 tablespoons olive oil onto a 18-by-13 inch rimmed baking sheet. Use a spatula to release the sticky dough from the sides of the bowl and then pour it onto the pan. Pour 2 more tablespoons of olive oil over dough. Gently stretch the dough to the edges of the sheet by placing your hands underneath and pulling outward. Let the dough proof for 30 minutes in a draft free place. During this time, it will likely shrink back bit, so during the 30 minutes, check on it twice and stretch it back to fit the pan. After 30 minutes, dimple the dough by pressing your fingers into the dough at an angle. Make the brine by stirring together salt and water until salt is dissolved. Pour the brine evenly over the dough. Let the dough proof for about another 45 minutes in a draft free place. The dough should be light and bubbly after this final proof. Thirty minutes into the final proof, adjust rack to center position and preheat oven to 450°F. If you have a baking stone, place it on rack. If you don't have a baking stone, you can invert another baking sheet and place it directly on the rack while the oven preheats. Sprinkle the dough with flaky salt and evenly spread the olives, fennel and red onion over the dough. Bake for 30-35 minutes directly on top of stone or inverted pan until bottom crust is crisp and golden brown when checked with a metal spatula and the top is golden brown. 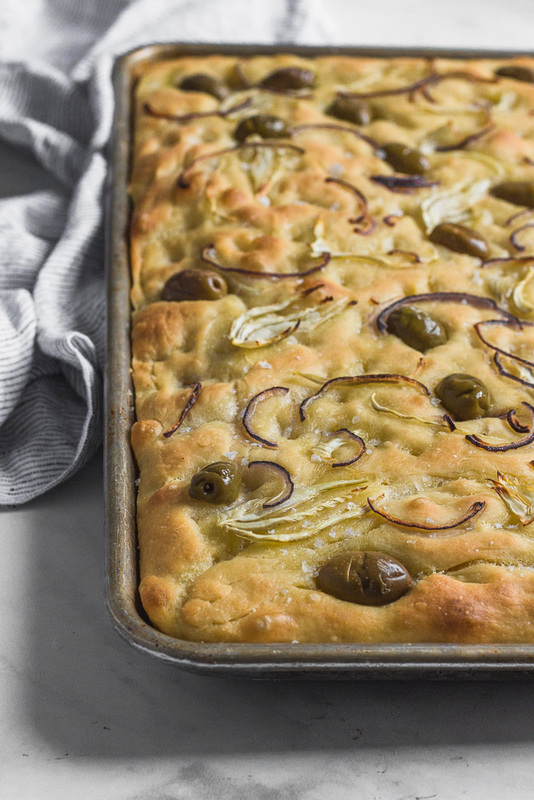 *If a whole sheet pan of focaccia is a bit too much, fear not, it freezes beautifully! Just cut the focaccia, wrap tightly in plastic wrap, and stash it in an airtight container or bag. When you want some focaccia, just discard the plastic wrap, wrap the bread in foil & reheat it in a 325 degree oven until warmed through. Then unwrap the bread so that the edges crisp back up a little & serve. **The original recipe for Ligurian Focaccia from the Netflix series Salt, Fat, Acid, Heat can be found here!